Turbans! I don’t know when it happened. When I first became enthralled with their tantalizing appeal. Suddenly I realized that I had been captured by their allure, and that it had been going on for some time. I tend toward the vertical with my headwear and I love the height and versatility of a turban or headwrap. Not that I don’t adore brims and a multitude of shapes when I’m scanning for a crone crown. But at this point in my life, turbans catch my attention in a heartbeat. But then I’ve had headwear crushes before! The turban that I wear in these photos had been patiently waiting in the hat room for its debut. I discovered it over 20 years ago on sale in a vintage shop that closed long ago. This year it was accidentally placed amidst the red hats, and I fell in love with its pattern adorned with multicolored beads. Surrounded by its red sisters, which gave prominence to its details, I suddenly realized its potential. In the process of falling in love, I remembered the green vintage jacket that reflected one of the colors in the turban’s pattern. And the ensemble developed rapidly from there. Estate sale shoes and bag with gold trim finished off the outfit in a flurry of inspiration. As with all beloved ensembles, there are alternative accessory choices within my reach. Especially when my collections are lying in wait for the a creative swirl of energy that comes with the discovery of a turban that had escaped my eye for years. I don’t follow the rule of eliminating a piece from my inventory if it hasn’t been worn for a year. How many outfits would never exist with this limiting practice. These vintage shoes have been waiting for two years for the perfect combination, and I couldn’t resist adding the green gloves to replace the red. As long as I have storage space and the love of sartorial adventure, I’m keeping the pieces that I view as beautiful and endearing. I know that sometime in the future, if I live long enough, they will find a way into my heart. Vintage turban – vintage shop; vintage green jacket, both pair of vintage gloves, both pair of vintage shoes and bag – estate sales, black jeans – Paris boutique, gold earrings – consignment shop, bracelets and watch – estate sales and gifted. 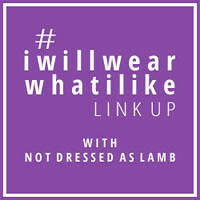 Linking up with Patti’s Visible Monday HERE, Catherine’s #iwillwearwhatilike HERE and Cherie’s Shoe And Tell HERE. I agree with YOU about that SILLY one year rule!RIDICULOUS! YOU are TRES SMART TODAY! Oh, what a combination of colours! The green jacket is wonderful and your turban is beautiful – as you are! So nice to see an outfit with different accessories – it’s very inspirational. So pretty and chic ! I totally agree about the whole one year rule BS. I know if I love the piece I will find a way to wear it eventually. I really liked this ensemble with the red gloves. Wonderful adornments. Love the way you showed us the mix/match of different color combos. And you are certainly one woman who can wear turbans. not all of us can. Sartorial splendor indeed. Happy Thanksgiving and my personal thanks to you for such an inspirational blog. Oh, you just look incredible!!! I have just turned 60 and you are truly giving me something to aim for as I get older. I am a little overweight and inactive these days and that is now going to change! Thank you for the push. I agree – total nonsense about the one year rule – I still get out some lovely pieces that are over 20 years old – you just have to keep your shape though! love the turban – great with the green. What a gorgeous turban, and I am rather envious of that beautiful fitted jacket too. It’s a very stylish ensemble – of course! Oh Judith, this is so classy and beautiful! You are the true lady! I really like this type of turban. I was bought a black turban by a colleague last year which I quite like and I had a grey angora one which doesn’t sit right but this type might be ok! You look beautiful in that winter green (lovely brooch too!) I’m glad you waited to love it for 20 years- it knew when its time came, it would be truly wonderful! I’ve got some brooches which I’ve only started wearing recently which I have had for 20 years too! It’s only now that I love wearing brooches! P.S. I have a favour to ask- I’ve entered Lady Vintage’s competition on Facebook to style one of their dresses and send in a photo and if you liked my picture best out of the entries, I’d love it if you felt able to vote for me by liking my picture! Cheeky, I know, but I really want to win- never won anything like that before! If not, please don’t worry, it is being very cheeky!!! I think the jacket is incredible. Personally, I prefer it with the green pumps but, either way, you look fabo. Of course Kezzie. Done! Hoping that you win! I love this turban on you! You look stunning and I think each way you’ve styled it is as pretty as the one before. I am partial to the red gloves, though!! Have a wonderful Thanksgiving! Fabulous! Look at you rocking skinny jeans!!! Hi Judith: This is my first time seeing your web site, and it truly made me smile. It is like seeing myself in another body. I wore a turban on my wedding day, in 1969 and yes I find it very hard to leave my home without a hat. You’re so elegant and classy and I am so glad to have found this lovely site. My family and I have endured some hard times (medically) this year and I Look for a little lite hardyness when I can find it. Thank you for starting my morning with something that made me smile. How fortunate that you had the patience to let this turban play the waiting game, allowing its moment to come when you and it were in perfect synchronicity. I particularly like the delicate beading which lifts it out of the ordinary, although can a turban ever be seen as ordinary? Your jacket is the perfect partner for this and I do like the vibrant splash of the red gloves too. You look so graceful and elegant as ever. Your blog is like a veritable Aladdin’s cave and I’m enjoying every little gem. The patterned turban is stunning with your beautiful vintage jacket. It works so well with both the reds and greens. I so agree about keeping items even if they haven’t been worn , their time to shine sometimes emerges out of the blue. Very chic. I love the cut and colour of the jacket. I cannot believe you have had a hat (turban) for TWENTY years without wearing it once. That is something I could not do. When I fall in love with a garment, I want to wear it as soon as possible. Love it all Judith! Especially the gloves and shoes. And, that jacket looks like it was custom made for you. Beautiful!! Gorgeous. Striking! It’s so thrilling when pieces just fall together like that. The first one is the snowball and the rest just hop on for the fantastic ride. Fun! Exhilarating really. The beads in the hat are beautiful details. And I like how you’ve switched out shoes and gloves. Like you, I like to hang on to clothes as long as I can.